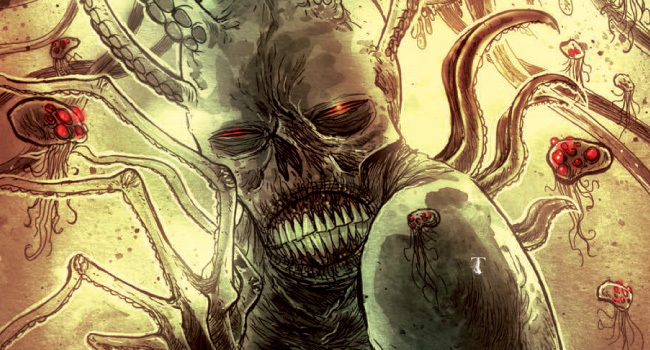 The Squidder is a collected edition of issues 1-4 of the comic miniseries by the same name and will be released on February 10, 2015 by IDW Publishing and 44FLOOD. A 128-page release, both story and art are handled by Ben Templesmith (30 Days of Night, Wormwood: Gentleman Corpse, Fell). The last war waged by the human race has been fought, and we have lost. The universe has been invaded by interdimensional beings, and, despite the best efforts of the human race, we have been conquered. Human beings now live in one of two states: attempting to eke out a meager life while staying out of sight of our alien overlords, or throwing in with the invaders and hoping to be spared from the coming cull. Little do they know of the ultimate plan of the parasitic hive mind that has conquered us all–a plan that spells doom not only for humanity but also for the entire universe itself. Humanity’s history has been wiped out by the alien hordes, and humans are treated as cattle, used for food or amusement…or for experiments much darker. Through this landscape strides Jack, last of the vaunted Squidder Legions. Of course, these legions–soldiers bio-engineered to stand toe-to-toe with the invaders–are our last hope. They made the invaders bleed in return for the occasional victory but were eventually defeated. Jack is a relic, a man forgotten in this post-war world, who seeks absolution in death. Prevented from killing himself by a bio-engineered mechanism, he walks the world hiring out his services to whomever can pay, constantly hoping to find something strong enough to end his existence. He has had everything taken from him–his family, his brothers-in-arms, his will to live; he is a man who has nothing to lose. Hired for one more job (recovering a temple priestess who has been bought by a petty warlord, only then to be stolen by a rival faction) he hopes he has finally found a task strong enough to kill him. Little does Jack know, rescuing the priestess will set his feet on a path that will bring back his old fire and will. With his and her combined efforts, humanity’s salvation may very well come about. Templesmith’s story is an absolute page-turner, drawing the reader ever onwards and delivering satisfaction on multiple levels. While having more than enough action in the narrative, the history leading up to the current state of events is also thoroughly parsed through, and both of the main characters’ motivations are explained. The post-apocalyptic situation/setting, while fairly contained, is definitely rendered in no unsure terms. The reader is drawn into the setting and bonded to the two characters and their goals. Despite the leanness and meanness of the story, this experience is thoroughly satisfying. The only problem is, it ends too soon. Everything flows organically along at an optimal pace, but I, for one, would enjoy more stories from this setting. Both the past, present, and future of this world is rife for expansion. The art is very angular, abrasive, and chaotic. 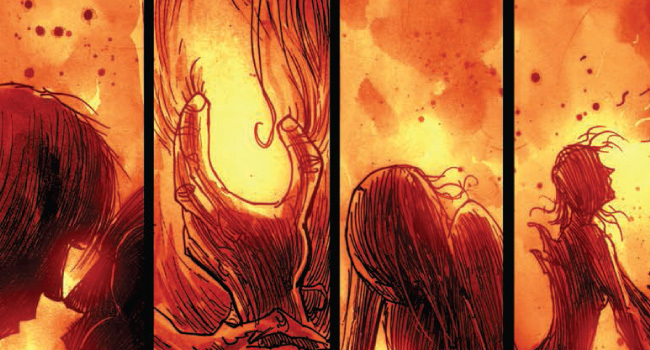 It is perfectly suited for this type of story, and both Templesmith’s narrative and visuals complement each other wonderfully. His character designs are spot-on, while his depiction of the action sequences are dynamic and perfectly depict the chaos of the battlefield. His characters are sometimes grotesque, sometimes shown in a twisted, raw manner, but the emotions easily shine through and create a link to the reader. Templesmith alternates between a washed-out style, with sketched in backgrounds and action details, and a more exacting style that incorporates heavy shading, detail, and nuanced expression; this artist never fails to deliver the goods on every level. Ben Templesmith has really outdone himself with this release. Both engaging, and enthralling, his vision of our possible future is bleakly impressive. When it comes down to it, this is one of my favorite reads of the new year. Story and art are perfectly suited to one another, and the reading experience has been absolutely sublime–this is a totally immersive experience and an absolute pleasure to read. Here, we have a thrilling new universe that draws from many different sources. The Squidder is an excellent release. Hopefully, we’ll get more stories set in this world. This is highly recommended reading. Enjoy!